I don’t often post in my blog about restaurants – there’s plenty of that out there on the Internet as it is. However, work has gotten completely bananas and I’ve been doing waaaaay more eating out than I have cooking at home. In the past month or so, I’ve hit MetroFresh a number of times. Its fast, healthy, and homemade. There’s a great patio to sit out on and have a nosh and a glass of wine. Everything I’ve had there has been exceptional – soups are often the star here – but this one salad I had a few weeks ago has been stuck in my mind. 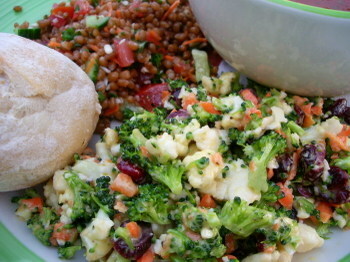 Mitchell (the owner) calls it his "Veggie Trail Mix Salad". It’s equal parts chopped broccoli and cauliflower tossed with shredded or chopped carrots, Craisins, and dressed with a honey dijon mustard dressing. It’s such a quick and easy salad that has such good flavor and crunch, I had to talk about it here. This is also a great dish that you can wing if you wanted – adjust the ingredients to your taste. A high quality bottled honey mustard dressing would do you just fine in this. Recreate this at home – you won’t be disappointed. LOOOVE the MetroFresh. They have a tuna salad stuffed avocado that I’ve been lusting for ever since I had it. I just discovered your blog while googling for a good peanut butter cookie recipe. I’m a pastry chef in Athens and was glad to find that other foodies exist in the Atl area. You work long enough in this industry, it can be easy to forget that your job is your passion. Good to see someone else who loves what they do. I have been a lurker for a while, but that salad looks so yummy, and all those crisp veggies and then the chewy craisins… I may have to try and whip something like this up on my own! Don’t think we have MetroFresh here near Boston. This veggie salad looks delicious. Thanks for the gorgeous photo, I am definitely going to have to try to recreate it at home. The idea of all those fresh veggies in a delicious dressing is wonderful. That vegie trail mix looks very appetising, those little florets of broccoli and cauliflowers are so cute.